It's been a while since I did a 5 Friday Faves post, so here it is, my special summer edition! 1. Crispin Cider: I'm usually a beer girl, but sometimes I like to change things up. Hard cider, when not too sweet, can be a refreshing change in the summer. Recently, I tried Crispin Brut and it was delightful! 2. Bright shorts. Clothing can be tricky for a stay-at-home mom in the summer. I need to wear something comfortable when I'm hauling kids to and from parks all day, but I also like to feel a least somewhat pulled together. Enter my favorite pair of shorts of all time, in all kinds of bright colors, at a fantastic price point from Francesca's Collection. (Side note: I recently walked into this mall store for the first time and it is full of cute clothes, accessories, and gifts. Highly recommend!). 3. Two movies: I can't choose just one. About Time and Boyhood are both such great-- and very different movies. (Or should I say "films" to sound deeper?) Anyway, About Time is fun, romantic, poignant, and completely original. Boyhood is beautiful, heartbreaking at times, and also completely original [it was filmed over a period of 13 years with the same actors, so you see the real-life changes that come with age]. 4. 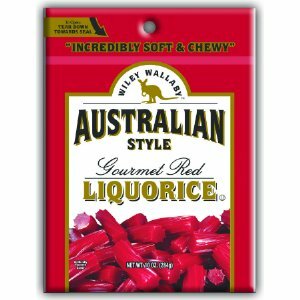 Wiley Wallaby Red Liquorice. Even better than Twizzlers, you'll find me munching on this slightly spicy, not-too-sweet chewy candy throughout the day. 5. Aveeno Positively Ageless Scrub. I recently decided I needed a facial scrub that was designed for more mature [i.e. : not 13-year-old skin], so I gave this affordable drugstore find a whirl. I love it. I use it once or twice a week and my sensitive, combination skin feels fresh and clean afterwards, not dried out and not oily. What are some of your summertime favorites? You can also connect with me here: Facebook, Twitter, Instagram, & Pinterest. P.S. The anthology I'm in, Only Trollops Shave Above the Knee, is available now! It's full of fantastic essays written by some very talented writers. What Would You Do With One Free Day?